Kaveh Pahlavan, is a Professor of Electrical and Computer Engineering (ECE), a Professor of Computer Science (CS), and Director of the Center for Wireless Information Network Studies, Worcester Polytechnic Institute (WPI), Worcester, MA. He is also a visiting Professor of Telecommunication Laboratory and CWC, University of Oulu, Finland. His area of research is location-aware broadband wireless indoor networks. He has contributed to numerous seminal technical publications and patents in this field. He is the principal author of the Wireless Information Networks (with Allen Levesque), John Wiley and Sons, 1995 and Principles of Wireless Networks -- A Unified Approach (with P. Krishnamurthy), Prentice Hall, 2002. He has been a consultant to a number of companies, including CNR Inc., GTE Laboratories, Steinbrecher Corp., Simplex, Mercury Computers, WINDATA, SieraComm, 3COM, and Codex/Motorola in Massachusetts; JPL, Savi Technologies, RadioLAN in California; Aironet in Ohio; United Technology Research Center in Connecticut; Honeywell in Arizona; Nokia, LK-Products, Elektrobit, TEKES, the Finnish Academy in Finland; and NTT in Japan. Before joining WPI, he was the director of advanced development at Infinite Inc., Andover, MA, working on data communications. He started his career as an assistant professor at Northeastern University, Boston, MA. He is the Editor-in-Chief of the International Journal on Wireless Information Networks. He was the founder, the program chairman, and organizer of the IEEE Wireless LAN Workshop, Worcester, in 1991 and 1996 and the organizer and technical program chairman of the IEEE International Symposium on Personal, Indoor, and Mobile Radio Communications, Boston, MA, 1992 and 1998. He has also been selected as a member of the Committee on Evolution of Untethered Communication, US National Research Council, 1997 and has led the US review team for the Finnish R&D Programs in Electronic and Telecommunication in 1999 and NETs project in 2003. For his contributions to the wireless networks he was the Westin Hadden Professor of Electrical and Computer Engineering at WPI during 1993--1996, was elected as a fellow of the IEEE in 1996 and became a fellow of Nokia in 1999. From May to December of 2000 he was the first Fulbright--Nokia scholar at the University of Oulu, Finland. Because of his inspiring visionary publications and his international conference activities for the growth of the wireless LAN industry, he is referred to as one of the founding fathers of the wireless LAN industry. In the past few years his research work has been the core for more than 25 patents by Skyhook Wireless, where he acts as the chief technical advisor. In January 2008 Steve Jobs announced that Skyhook Wireless’s WiFi localization technology is used in iPhone. Details of his contributions to this field are available at www.cwins.wpi.edu. Prashant Krishnamurthy is an associate professor with the graduate program in Telecommunications and Networking at the University of Pittsburgh. At Pitt, he regularly teaches courses on cryptography, network security, and wireless communications and networks. His research interests are wireless network security, wireless data networks, and position location in indoor wireless networks. He is the coauthor of the books Principles of Wireless Networks -- A Unified Approach and Physical Layer of Communication Systems and is a co-editor of Information Assurance: Dependability and Security in Networked Systems. He served as the chair of the IEEE Communications Society Pittsburgh Chapter from 2000 to 2005. He obtained his PhD from Worcester Polytechnic Institute, Worcester, MA, in 1999. 1.2 Evolution of Wide-Area Networks. 4.4 Coding for Spread-Spectrum and Code-Division Multiple Access Systems. PART THREE: LOCAL AND PERSONAL-AREA NETWORKS. 9. IEEE Wireless Local-Area Network Standards. 10. IEEE 802.15 Wireless Personal-Area Network. Networking Fundamentals Visit the companion website to access the instructors solution manual and other useful resources. 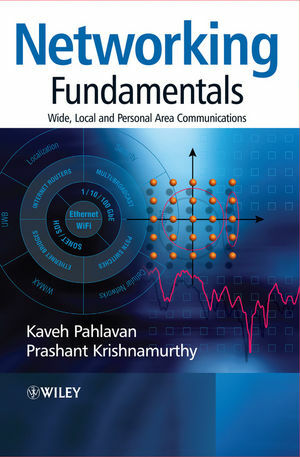 · A fully comprehensive, self-contained textbook on networking fundamentals – all the essential reading for advanced undergraduate and graduate students in one book!